Although Peter says he would prefer Match.com since he's from the city, both agreed they would invest in FarmersOnly as it's personalized. A few design tweaks would be good (think OkCupid's design), but the company is clearly doing something right. Match.com is definitely the leading company in the market and will make more money, but FarmersOnly is more fun, based on its unique audience. 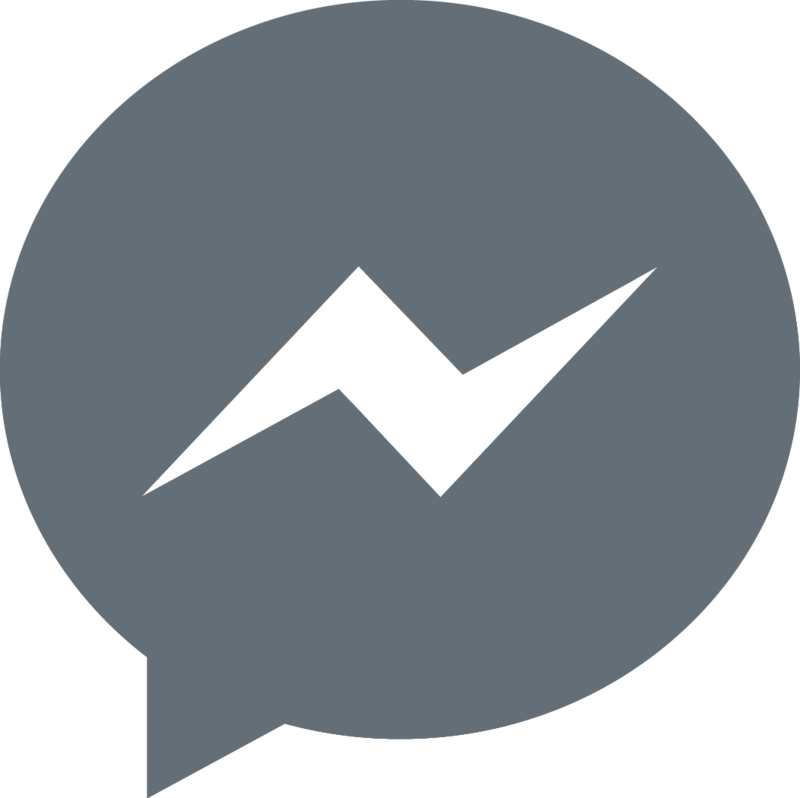 If you are looking for ways to meet someone special online, you're not lacking options. Bumble, Christian Mingle, Tinder, eharmony, and Zoosk are just a few popular dating apps and websites. In today's Pricing Page Teardown we are reviewing two profitable, but very different, dating sites — the generalist Match.com against the niche platform FarmersOnly.com. Although Match.com is an industry leader in the dating world ($4.8 billion market cap in 2017), FarmersOnly.com has carved out a successful niche based on those who crave the country lifestyle. Whereas Match.com has a general target audience, FarmersOnly.com's target market is very specialized. Those without a tractor (or at least an affinity for the country life) need not apply. Let's take a look at their price strategy and discover how it relates to their buyer personas and registration process. In addition to having different target markets, Match.com and FarmersOnly are different in terms of sign-up. 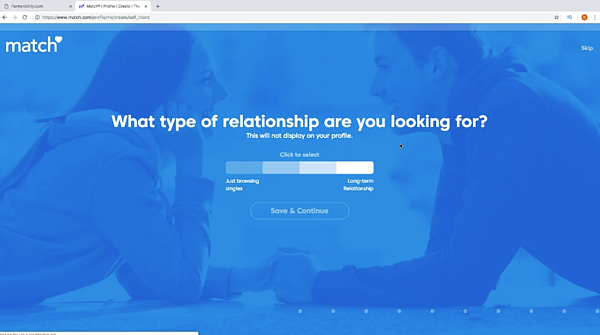 Match.com leans more toward a pleasing design but a lengthy process while FarmersOnly chooses functionality and asks the user quick, basic questions. 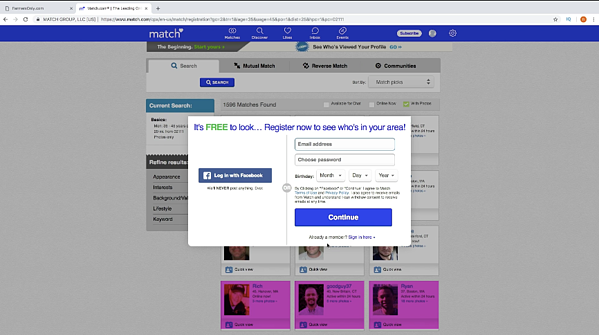 The design of Match.com's sign-up is no doubt attractive. However, it takes time to fill out all of the information. By the time you get to the pricing page, the differences are not very clear in terms of package benefits and are somewhat misleading. For example, Match.com has two plan categories: Bundle plans and Basic plans. Looking at Match's pricing tiers under Basic plans, there are check marks beside Email Read Notification and One Profile Review per Year. But in the small print above, it's discovered that these features are not included in the basic plan. As Peter says, it's a little trickery from a design perspective. This misleading design tactic is an annoying pattern that is often the case with website sign-ups and another argument for functionality over attractiveness. In addition to being misleading, the plans are also confusing. 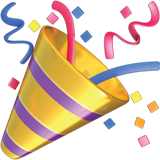 Under the “Bundle plans,” it's difficult to tell if you get the Match Guarantee with the annual twelve months bundle since it's only listed for the six-month package. Another interesting thing to note with Match is that photos of people already on the site are presented before you even finish signing up. It serves to play on your emotions. You can only see all of these people if you complete registration. To really do anything on the site such as communicating with other members, you have to pay. Benefits are clearly listed at the top of the page for upgrading. 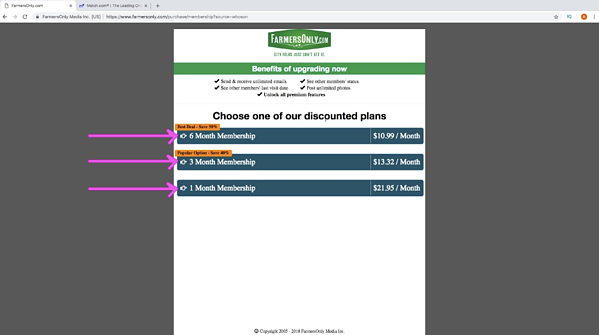 As you can see, FarmersOnly also gives the option for a $21.95 one-month membership (a nice feature if you're on the fence about signing up), as well as a three-month and six-month membership option. The FarmersOnly site has a better format in terms of showing benefits/packages. It's also not a hassle to sign up, which seems important considering who they are targeting (busy farmers and people working outdoors). Both sign-up processes for Match.com and FarmersOnly are ultimately designed to get you in the sales funnel but FarmersOnly seems to do it more with the user experience in mind. If you're looking to find a farmer, rancher, cowboy, cowgirl or animal lover, FarmersOnly claims to be the place to go. While there have been other companies who have tried starting niche dating sites such as for vegans and dog lovers, FarmersOnly has successfully honed in on a specific, but wide audience. That said, there are very stark differences between FarmersOnly and Match in terms of population density. 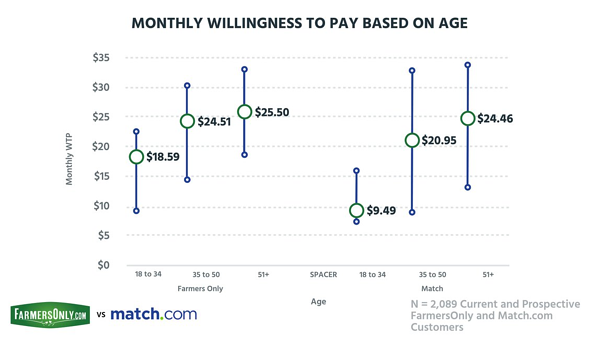 When we asked 2,089 current and prospective FarmersOnly and Match.com customers about their willingness to pay for the service, we found that people in the rural areas, as to be expected, are more willing to pay for FarmersOnly (about $25 per month). 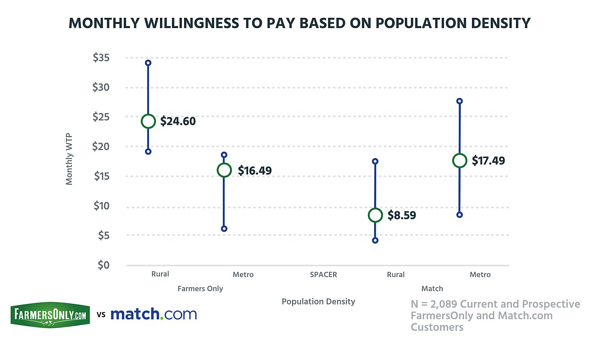 It's interesting to find that the rural audience is almost 2X less willing to pay for Match.com as compared to the metro market. This data suggests that the market is only interested in dating sites if they're specialized. We've seen these location-based pricing preferences before. When we tore down The New York Times pricing we found that metro-livers were more willing to pay for the newspaper than country-dwellers. This is more evidence that location is a fundamental component of pricing. Match.com has the inverse factor. Although the site is targeting a wide range audience, Match needs a massive base to justify this, whereas FarmersOnly's niche is easier to defend. Republicans, who tend to be more in the Southern/Midwestern states, are also willing to pay more than 2X the amount for FarmersOnly over Democrats. FarmersOnly clearly understands who they are marketing to and shows the power of the niche. 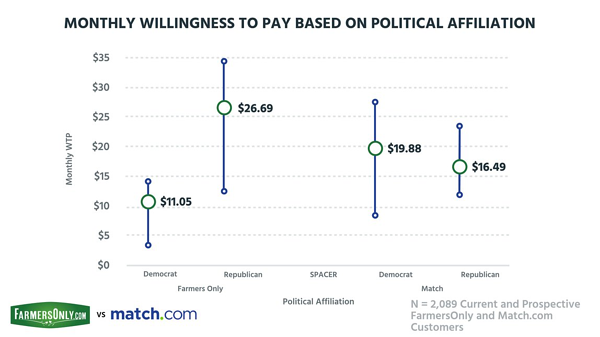 The willingness to pay for Match.com between Democrats and Republicans is only around a $3 difference. Again, this data demonstrates how Match is after a generalized audience. In terms of age, we found that, just as with our Tinder vs Bumble comparison, males are typically willing to pay more for dating services, while females are generally more inbound. 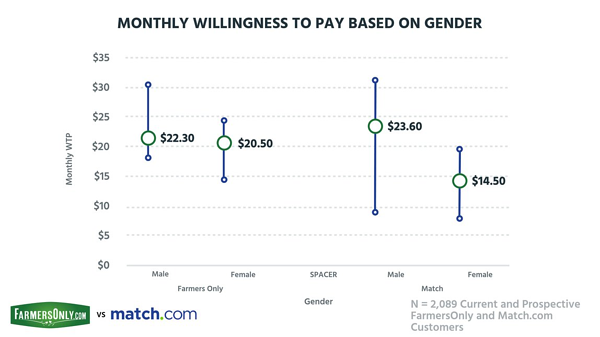 However, the willingness to pay between male and female is much more even for FarmersOnly ($22.30 vs $20.50) as compared to Match's gender comparison—an almost $10 difference. As Patrick explains, the range here for females is lower than the range for males, but the FarmersOnly's niche is basically protecting the bottom line and then it becomes a measure of the total adjustable market. This suggests that both genders are willing to pay to find someone who matches their lifestyle, giving FarmersOnly the ability to build a sustainable business. Match, being generalized, needs to get more people on their site. A bottleneck is created when the female audience is not really willing to pay the upgrade prices. The site can only work effectively if both males and females have similar membership plans. 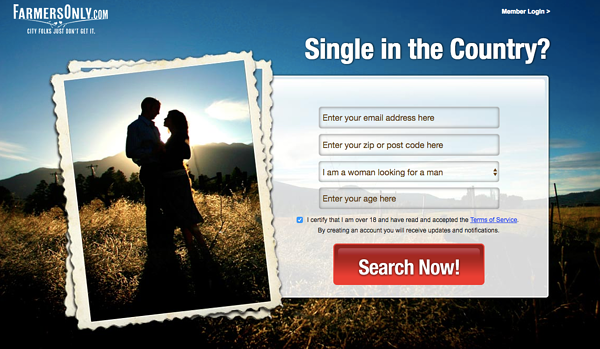 Age plays a significant role with dating websites. As you get older, your willingness to pay for dating increases. For example, on both sites, people ages 51+ are willing to pay around $25 per month. Look at the significant range with age on Match.com. The site has a really low entry point at $9.49 and this is being paid by people ages 18-34. Apps like Tinder and Bumble are aggressively competing for this segment. What's interesting to note with FarmersOnly, the base of the site is lower than those who are older but it has a really good heavy floor. This demonstrates the power of the niche and why you've seen various niche sites popping up, such as Christian Mingle. Generalized dating sites have to get to a critical mass in order to build a really good business. Sites like Hinge are working to fix their focus and even Bumble is doing things in addition to dating such as looking at the entire relationship. Most dating sites and apps, rather than going completely niche, are going niche from an experience standpoint. Lesson learned: Don't be afraid of the niche. If you have a high enough target market, there can be a higher willingness to pay than the general type of user. FarmersOnly can use this knowledge to go into different niches. Founder Jerry Miller has already created another niche dating site called CurvesConnect for people with extra curves. Also, understand the segments of your customers and their willingness to pay. As with FarmersOnly, this will guide how you advertise, your content, policies, etc.